Chair Size: 20 x 20 x 45 in inches approx. Traditional Home Furniture always have intrigued consumers. Traditionally handcrafted units are carefully made by hand keeping in mind the exact requirements of the clients. Aarsun Woods offers a wide range of home furniture handcrafted by skilled artisans from Saharanpur, India. The units are crafted and polished in traditional style that can be customized as per your need. Handcrafted home furniture is made by skilled craftsmen in royal simplistic and elegant design and finish. The Table is crafted in Oval Shape with linear designs at the circumference. The focal point of the Dining table is its base which has a bulging out spherical shape tapered at the bottom broad circular disk. The chairs have floral carvings at the edges and linear designs similar to the one on Table. 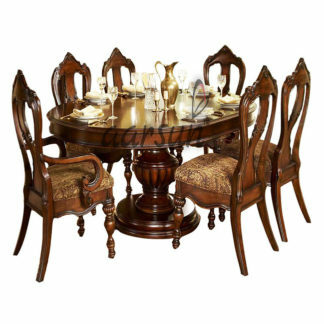 Overall, the royal Dining set comprises of 6 standard size chairs with an Oval Shaped Dining Table that can be customized exactly as per your requirement. The dining set made from premium quality Teak Wood (sagwan / sevan / sagaun) and hand-polished in natural walnut finish. The Dining Chairs are dispatched in a fixed manner while the dining table is dispatched in knock down state – 2 parts: Top and Base. The home furniture can be easily assembled without any issues. The termite resistivity of Sagwan Wood provides an extra edge as compared to other types of Woods. Sagwan Wood has high dimensional stability which prevents it to shrink or wrap under extreme weather conditions.